Lower Kalskag is located on the north bank of the Kuskokwim River, 2 miles downriver from Upper Kalskag. It lies 26 miles west of Aniak, 64 miles northeast of Bethel, and 350 miles west of Anchorage. It lies at approximately 61d 30m N Latitude, 160d 21m W Longitude. (Sec. 02, T016N, R062W, Seward Meridian.) Lower Kalskag is located in the Kuskokwim Recording District. The area encompasses 1.3 sq. miles of land and .4 sq. miles of water. The climate is semi-arctic with maritime influences from the Bering Sea. Precipitation averages 19 inches, with 60 inches of snowfall. Temperatures range between -55 and 87. The Kuskokwim River is ice-free from mid-June through October. The site was originally used as a fish camp for families of Upper Kalskag, two miles to the northeast. In 1930, people began to establish year-round homes. 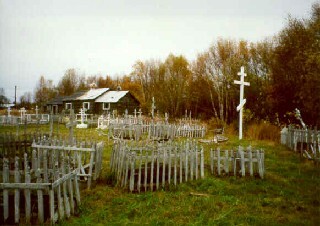 The Russian Orthodox residents of Upper Kalskag, a predominantly Roman Catholic village, moved to Lower Kalskag because of religious differences. The Russian Orthodox Chapel of St. Seraphim was built in 1940. A school was built in 1959, followed by a post office in 1962, a sawmill in 1965, and a power plant in 1969. The City was incorporated in 1969. Lower Kalskag is an Eskimo village of Russian Orthodox practitioners who relocated from Upper Kalskag in 1940. Subsistence activities provide food sources. The sale or importation of alcohol is banned in the village. Lower Kalskag's economy is predominantly based on subsistence activities. Salmon, moose, black bear, porcupine and waterfowl are utilized. Year-round employment is limited to the school, City and clinic. Seven residents hold commercial fishing permits. BLM fire fighting can provide seasonal income. An 85-foot well provides water, which is treated and piped to most homes and the school. The school, clinic and over 40% of homes use individual septic tanks and have complete plumbing. A 10,000-gallon community septic tank allows for piped sewage collection to part of the village. Funds have been requested to connect the 20 remaining homes using septic tanks to the piped sewer system, due to effluent ponding. The community also needs a washeteria. Refuse is burned or buried at a new landfill located between Lower and Upper Kalskag. The village is accessible by boat in summer and snowmachine in winter. Commercial barge lines deliver fuel and other bulk supplies in the summer. Passengers and other freight arrive by air year-round, through scheduled daily air services. The State-owned 2,200' gravel airstrip is shared by Lower and Upper Kalskag, and there is a road connecting the two cities. The climate is semi-arctic with maritime influences from the Bering Sea. Precipitation averages 19 inches, with 60 inches of snowfall. Temperatures range between -55 and 87. The Kuskokwim River is ice-free from mid-June through October.